Nissan recalls 24,000 cars with misplaced retaining clips necessary to hold the fuel tubes. February 27, 2019 — A 2019 Nissan Altima recall has been issued for nearly 24,000 cars to fix problems that can cause fuel leaks and fires. Assembly problems caused retainer clips to not lock into position between the low-pressure fuel tubes and the high-pressure fuel pumps. This may move the fuel tubes to the outside and interfere with the o-ring seal, allowing small amounts of fuel to leak. A continuous leak will cause illumination of warning lights and diagnostic trouble code P0087 will be stored in the system. It's also possible the fuel tube may completely disconnect and cause the Altima to run out of gas while driving. Nissan learned of an Altima customer who reported the smell of fuel in November 2018, sending engineers to check dealer inventory to inspect the 2019 Altimas. 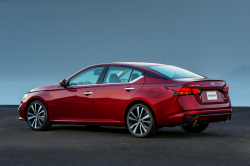 Altima drivers may notice leaked fuel or odors if the clips are not locked into position. Dealerships will inspect the low-pressure fuel tube retainer locking clips and the clips that hold the fuel hoses, rerouting the hoses into the holding clips and locking the retainer clips into place. Owner notices have already been mailed, but if you own a 2019 Nissan Altima and have questions about the recall, please call 800-867-7669. CarComplaints.com has owner-reported complaints about Nissan Altima cars.